Michelle Parker and Lassila De Moyon soar over the course in Sunday's $25,000 HITS Grand Prix, presented by Pfizer Animal Health, at the HITS Arizona Winter Circuit. 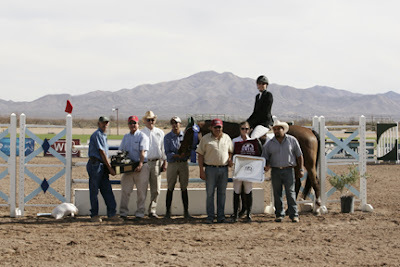 TUCSON, AZ (March 11, 2011)—Competition at the HITS Arizona Winter Festival at the Pima County Fairgrounds in Tucson, Arizona was highlighted by big wins for Michelle Parker in the $25,000 HITS Grand Prix, presented by Pfizer Animal Health, and Gretchen Lof in the $2,500 Devoucoux Hunter Prix. Maryland’s Ken Krome set a twisting course which had 16 efforts, including a triple combination and a liverpool mid-way through the track, with a time allowed of 90 seconds for Sunday’s $25,000 HITS Grand Prix, presented by Pfizer Animal Health. The first of the two clear rides came three trips in when Janine Weatherby of Bellevue, Nebraska rode flawlessly through the course aboard Laurel Lachowiez’s Allegro. 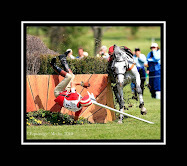 Parker, who had two mounts in the class, followed immediately with a clean round aboard her own Lassila De Moyon to ensure a jump-off. The rest of the class was unable to follow suit, which kept it a head-to-head jump-off battle between Weatherby and Parker. Weatherby was first to go and set the Great American Time to Beat at 53.545 seconds but had eight jumping faults, which enabled Parker to take a careful approach in the jump-off and score the win. Rounding out the top five were Bjorn Ikast in third aboard Brave Heart and fourth aboard Monte Cristo, while Parker finished fifth aboard her second mount Clever. Grand Prix action resumes on Sunday, March 13 at the HITS Arizona Winter Circuit with the final $25,000 Strongid C 2X Grand Prix, presented by Pfizer Animal Health, to close out the season in Tucson. In Saturday’s $2,500 Devoucoux Hunter Prix, a qualifier for the all-new Diamond Mills $500,000 Hunter Prix Final, Gretchen Lof of Cave Creek, Arizona piloted her own Dresden to victory when she scored an 86 in the first round and an 84 in the handy, for a total of 170. 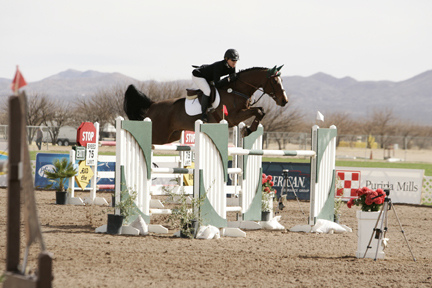 Gretchen Lof and Dresden on course in Saturday's $2,500 Devoucoux Hunter Prix at the HITS Arizona Winter Circuit. 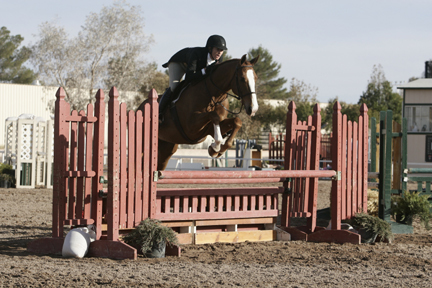 Brian Post of Phoenix, Arizona set a lovely course which featured classic hunter elements such as hedge and hay bale jumps. The win was the second of the season for Lof, who two weeks ago during the Arizona Winter Classic captured the win aboard Nancy Gray’s Shine on Me. She has several other top finishes in the class, including a second-place finish aboard Dresden in the second week of the Circuit. Lof currently sits in the number 23 spot in the preliminary Diamond Mills Hunter Prix Rider Rankings with three of the five classes needed to become eligible and 75 points aboard her leading mount. Tim Herrick of Scottsdale, Arizona finished second aboard Kelley Meredith’s Union Square and fourth aboard Bobbie Schaef’s Quiros Z. Susie Straus of Tucson, Arizona aboard Ryann Thomas’ Welcome and Rebecca Reyes of Saratoga, California aboard her own Dinner for Two finished third and fifth, respectively. Julia Dotoli of HITS and Brady Karren, Arenus Equine Sales Specialist/Nutritionist - West, present the awards for the Devoucoux Hunter Prix and the Arenus Performance and Conditioning Award to Gretchen Lof and Dresden. In addition to capturing the title in the Devoucoux Hunter Prix, Lof also won the Arenus Performance and Conditioning Award. Arenus Equine Sales Specialist/Nutritionist Brady Karren was on hand to select this week’s winner and presented the award to Lof. 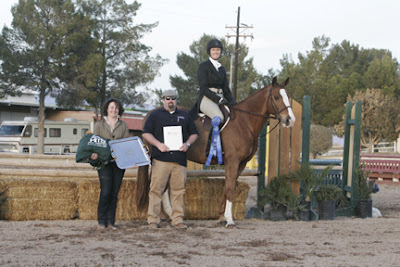 The Arenus Tack Room Award went to Susie Straus and Wellspring Farm. Both winners received Arenus products from Karren. On Saturday, March 13, at nearly the same time, HITS will host the final three qualifiers of its 2011 Winter Show Season at all three of its Circuits in Tucson, Arizona; Ocala, Florida; and Thermal, California. 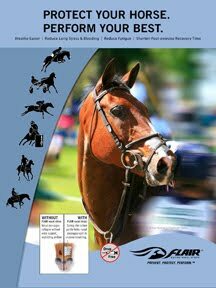 Starting on the East Coast, the $10,000 Devoucoux Hunter Prix will kick things off on Saturday night under the lights in the Main Hunter ring at HITS Post Time Farm in Ocala, while 1,700 miles west in Arizona riders will take to the hunt in the $5,000 Devoucoux Hunter Prix. Then at the HITS Desert Horse Park in Thermal, the $25,000 Devoucoux Hunter Prix will wrap up this Saturday Night Coast-to-Coast Special, before the focus shifts east to the HITS Culpeper and Saugerties spring and summer show series.